Girlee and I were invited last week to a food tasting session at Petit Bowl, which is located at United Square (#01-77/78). 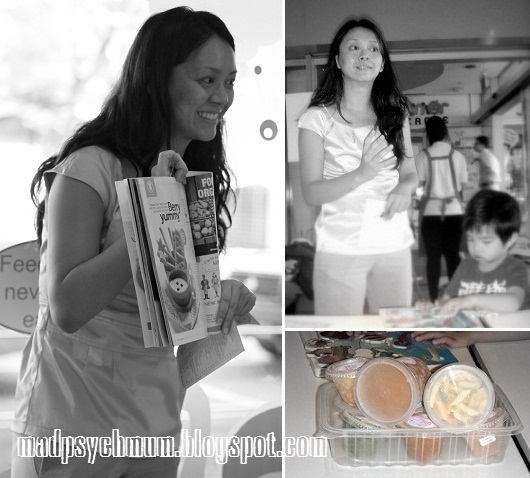 We were joined by other mum bloggers, Ruth, Daphne, Jus, PC and their little ones. It was great meeting up with the very people whose blogs I read so often! It's like I know them (and their kids) even though I don't actually know them, if you know what I mean. Aside from a near-accident (where she leaned backwards while sitting on the bench and almost hit her head on the floor but was thankfully saved by me as I'm always on high-alert even when I'm taking the above photos), she had fun﻿ playing with the other kids. The co-owner, Josephine, then gave us an introduction of their company, products and services. Petit Bowl, which started in 2009, aims to provide wholesome meals for parents who are too busy to prepare homemade meals for their children. The "frozen solutions", as Josephine calls it, are made with organic fresh ingredients and individually sealed in capsules that are portable and easy to heat up. We got the chance to taste 11 of the 70 over different combinations that are available both in the physical store as well as online. If you know my girl, you'll know that there is absolutely nothing she won't eat. Well, at first at least. Any food you dangle in front of her goes straight into her mouth; she then chews (with only 2 teeth no less) on it slowly, savouring the taste before giving you the verdict with a nod of approval (yummy!) or a spit (no way!). If you try giving her food that she had already deemed 'spit-worthy', she will shake her head rapidly at you while giving you the 'stink-eye'. True story. So it wasn't surprising at all that even though she was the youngest there, she was also the most enthusiastic food taster as well. Most of the food that she tried got the enthusiastic nod of approval except for lamb, which was deemed 'spit-worthy'. I guess she's just like her parents on this one. We don't really like the taste of lamb either. Her favourite was the Creamy Chicken Penne, which was also a hot favourite among the other children as well. I personally loved it and bought a cup home for Girlee to eat for dinner. It was pretty easy to prepare; just pop it into the microwave for 2 minutes and viola! Dinner is served. If you like what you see, the good news is that Petit Bowl is holding a giveaway! Two lucky winners (yes two!) will stand a chance to win a $25 Petit Bowl voucher each. 2) Select which of the following six statements are true for you (there is no limit to the no. of statements you can choose). 3) Leave a comment on this post! For example: "I'd love to participate in this giveaway! Statements #1, #4 and #6 are true for me." You can also share on what other products that you hope the e-shop will offer as well as any other feedback on Petit Bowl's products and services in your comments. UPDATE (I): I've picked the winners the old-fashion way of drawing from a hat (or a bag in my case). Got baby girl to stick her hands into the bag and out came two lots..
UPDATE (II): The outlet at United Square is no longer in operation. Please visit Petit Bowl's website for the location of other outlets. Disclosure: An invitation to the complimentary food tasting session was received from Petit Bowl for the purposes of this review. No monetary compensation was received; all opinions are my own.